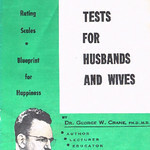 This marital rating scale booklet, Tests for Husbands and Wives, was given to me by my mom as a joke when I was a teenager. She couldn't remember where she had gotten it. She actually gave me 5 of these and I gave them to friends as high school graduation presents! As featured on BoingBoing 5/13/08.